So rubbish, in fact, that I’ve been unable to cycle for most of that time. Poor Eva has been sitting in the hallway, untouched and neglected. It may just have been my feverish delirium, but I could swear she’s been giving me puppy dog eyes, willing me to take her out for a ride. It hasn’t worked, though. After trying to fight through the infection for the first week, I took to my bed for the second week. The third week – last week – I was feeling well enough (though still coughing) to venture back to college but not so well that I could cycle all the way there and back. Instead, I’ve been forced to throw myself on the mercies of the London transport system. Every morning this past week has found me squashed into a metal box with hundreds of my fellow commuters, hurtling in the darkness through tunnels metres underground. How do people do this every day? It’s not just the rudeness of people who barge past me in their haste to get on the train, or the proximity of my nose to people’s armpits, or even the mild sense of panic I get at being in such an enclosed space. It’s also being dependent on a system that could break at any moment. Take Wednesday evening, for example. I’d decided to catch the Overground home from Clapham High Street to Dalston Junction; it takes a bit longer than the tube, but I prefer to be above ground. It’s less stressful. We’d made it as far as Shadwell when the driver announced we would be terminating there, due to a broken down train up ahead. Assured that we would be able to catch the next train, everyone shuffled off and stood obediently on the platform. But when the next train arrived, about ten minutes later, it too was terminating at Shadwell. It was at this point, starting to get a little impatient, I walked along the now very crowded platform to check the platform indicator. Service suspended, it said. Nice of them to tell us that, I thought. By now it was well over an hour since I’d left college, and I still had some way to go – with no idea how I was going to do so. 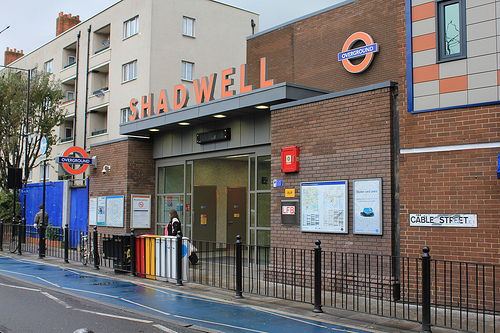 Of all the places to have been turfed off the Overground, Shadwell was probably one of the least convenient. My options seemed to consist of the DLR – which doesn’t go anywhere near Stoke Newington – or a bus. But which bus? And where exactly is Shadwell, anyway? As it turned out, Shadwell is not a million miles away from Whitechapel, from where I could catch a 106 home. So that’s what I did. After about an hour on the bus, I finally made it through my front door – a mere two and a half hours after I’d left college. There’s nothing quite like a two and a half hour journey home on public transport to make a girl wish she was on her bike. Sure, cycling can be tiring and cold – particularly if the weather is miserable – but that’s nothing compared to the frustration of being stuck on a bus in heavy traffic, or a train line being suspended when you’re miles from where you need to be. I missed the reliability of my bike. I missed knowing exactly how long it’s going to take me to get somewhere, and I missed not having to depend on anyone else to get there. Dear cycling gods, I repent of everything I said. I cannot wait to get back on my bike. ← The end of the affair? That is one of the best parts of cycling, no matter what traffic or weather is like,my oh always know how long it will take! Welcome back from the dark side! Thanks! I was hoping to be back on the bike this week, but I’m still coughing and I seem to be developing a cold on top of everything else…so Eva will have to gather dust for a while longer. Good things come to she who waits? All the better for encountering the other side? Thanks. I’m not there yet, but hopefully it won’t be too long. I’m sick of being ill!